Gear 360 (2017): How do I use my Samsung Gear 360 (SM-R210) without a mobile device? 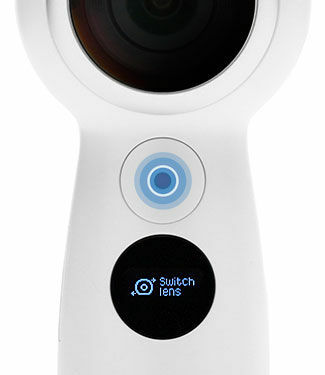 The Gear 360 can be used as a standalone device. Take a photo or video at a moment's notice by selecting a shooting mode, aiming the Gear 360, and then pressing OK. Without a connected mobile device, you cannot preview your shot or adjust some camera settings. Note: Use a single lens for 180° photos and videos and both lenses for 360° photos and videos. 1. While the Gear 360 is powered on, press Menu repeatedly until Settings appears on the display, and then press OK.
2. Switch lens will appear on the screen. Press OK.
3. Press Menu repeatedly to cycle through the available options. Press OK to select the lens. Note: When a lens is enabled, the corresponding green camera status light will turn on. 1. While the Gear 360 is powered on, press Menu repeatedly until the desired shooting mode appears on the display, and then press OK.
2. To take a picture or start recording a video, press OK.
3. To end the video recording, press OK or Back. Note: After you have taken a photo or recorded a video, it's time to edit it. But before you can edit, you need to stitch and save the file to your mobile device. How do I stitch videos and images taken with my Gear 360? Gear 360 (2017): How do I use the remove viewfinder of my Samsung Gear 360 (SM-R210)?